I cannot help but want to be better. Something within me compels me to constantly strive towards the impossible goal of perfection. From what I can tell, it is the nature of life. We are here to grow, along with everything else. I have recently begun to read Charles Haanel’s The Master Key System (free pdf download). I was turned on to this book after visiting the James Allen Institute’s Road Map to a Greater Understanding (which is a thing of beauty itself). You may be familiar with the film/book The Secret, which is centered on the idea of the Law of Attraction. Rhonda Byrne, the author/producer of The Secret cites The Master Key System as one of her main inspirations. This has helped the book to gain some popularity recently. 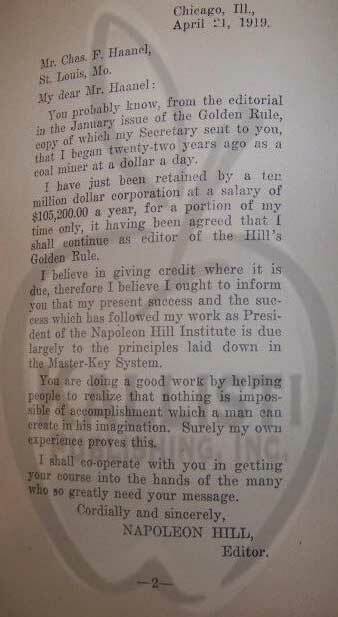 I also found some interesting information about Napoleon Hill, the author of the mega-hit book Think and Grow Rich. Hill wrote a letter to Charles Haanel, giving credit to The Master Key System for much of his own success. I feel the book has some worthy names who have declared its value. This has compelled me to give it a read. But it is the words in the book itself which will keep me reading. I started it on Saturday and read and re-read the first chapter each day (it is very short). My first impression is that there is great value in The Master Key System and I am excited to continue. Despite being a century old, it is very easy to comprehend. Haanel was quite the wordsmith and succinctly sums up the nature of reality in a few short pages. The first chapter essentially states that there are two worlds: the world within and the world without. The world without is a reflection and result of the world within, which is governed by our minds. Harmony within will produce harmony, optimism and affluence without. Harmony within means the ability to control our thoughts. Our conscious minds connect us to the outside world and our subconscious minds connect us to a world within of infinite potential and power. By controlling our thoughts we can learn to coordinate the conscious and subconscious mind, which is the great secret of life, Haanel says. There is a universal mind, which he likens to a fountain and is the source of everything, and each individual person is an outlet, or a river, for this fountain. The universal mind (the same thing as the subconscious???) is what drives us to grow and develop. Each of us, and all of our thoughts and actions, are a manifestation of the universal mind. Sound familiar? This same idea has been expressed before, many times. Yet, I can’t help but relate to Haanel’s explanation. He has added a bit of clarity for me. I can feel and understand it a little better. It is, he states, by controlling and directing our thoughts that we are able to bridge the subconscious and conscious worlds and open up a link of enormous strength and power. All thoughts are causes and the conditions of our lives are the effects of our thoughts. Therefore, it follows, that being the watchman of the thoughts will give us the power to bring about the surroundings we desire. In other words, our thoughts literally bring about our surroundings and our experiences. He finishes the first chapter terrifically: by having the reader take some action (something which I think he does in each chapter). This is where this book distinguishes itself from many others, which simply talk. Knowledge is potential power. It becomes actual power when we do something with it. I have done quite a bit of meditation, so this wasn’t too difficult for me. The first day, I had no problem staying still for about twenty minutes. The second day, about half way through, I felt the urge to swallow. I tried to resist but in the end, my body took over and demanded that I do so. Oh well! Other than that, I was successful. But I would need more than my fingers and toes to count the people I know who would struggle with this. Especially with the ubiquitous nature of the cell phone (can we even call them phones anymore?) and the ability to be constantly stimulated and inundated with information and distractions (do you bring a smartphone into the bathroom with you?). Even I find myself different from a decade ago. The moment I have a question, I feel compelled to turn to the internet. It used to be that I would try to think through the answer first, and then seek it out if I couldn’t come to a conclusion through my thoughts. Do you think you could sit erect and completely still for at least 15 minutes? I urge you to give it a try. Resist all temptations to act on your thoughts. If you haven’t practiced this before, it can be a challenge. But, I’ll tell you, there is an immense sense of power at simply commanding your body to be still and having it obey you. At first impression, Haanel seems wise. This is a nice way to start down the path to greater self-mastery, begin by declaring yourself the master over the conscious movement of your body. So, I have shared with you my experience from the first week of The Master Key System and its accompanying exercise. I will continue to share my experience in the future. Was my experience the same as yours? I would love to know. Looking for good morning messages of inspiration, love and humor?